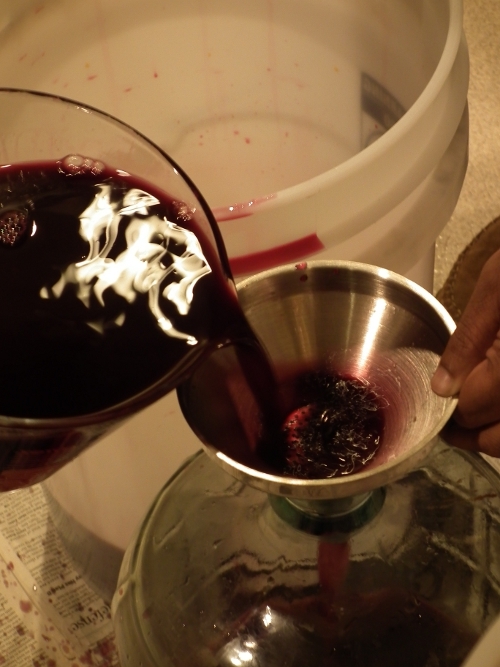 Yesterday evening we took the next step in making our wine. We picked up the grapes in early December. They’re from Behm Vineyard in California and get shipped here as part of a wine club. We got a Cabernet Franc and a Merlot. 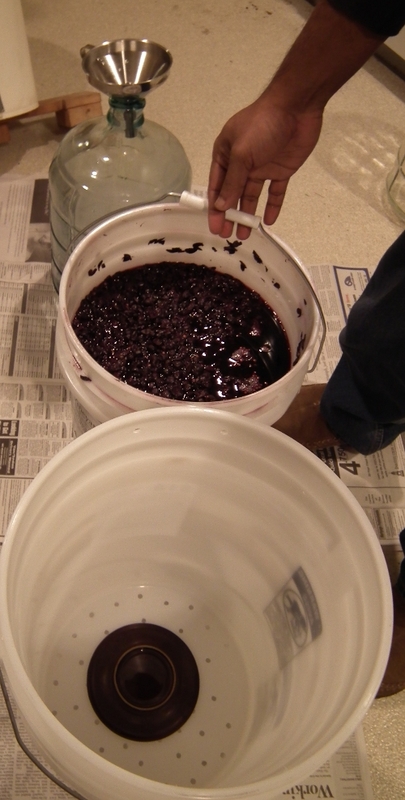 The grapes come crushed – so with skins and pips – and frozen in five gallon buckets. You thaw them out and once they’re warm enough you add a packet of wine yeast. 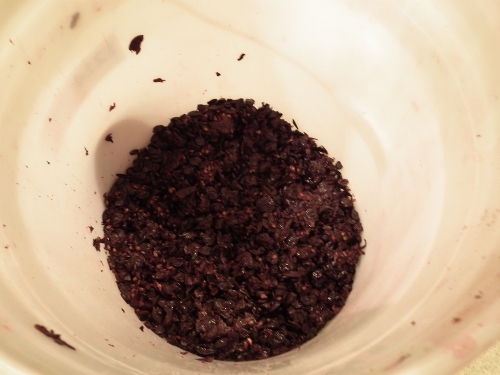 That and the yeasts already present on the grapes will get to work and after a few days you can smell that yeasty smell. To keep the yeasts invigorated you need to stir the bucket once or twice a day. A month later (that was yesterday) this primary fermentation is finished and it’s time to get rid of the pips and skins by pressing the grapes. We simply used part of my honey extractor: a five gallon bucket with holes at the bottom. 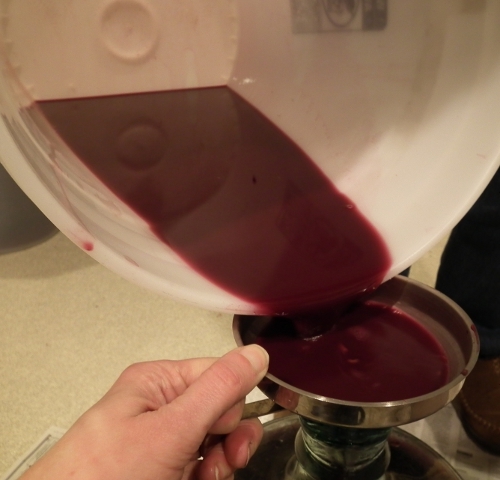 A lot of juice just pours out and then you put some pressure on the grapes to squeeze out more. 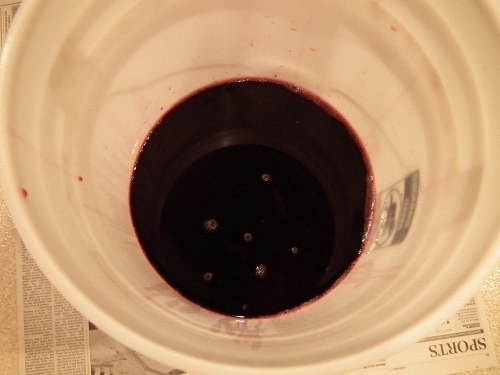 Each five gallon bucket of grapes yielded a little more than a 3 gallon carboy of juice. 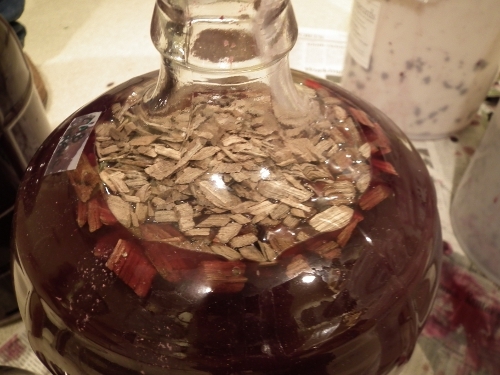 Every carboy got a handful of oak wood chips and was inoculated with a batch of malolactic acid bacteria to convert the stronger tasting malic acid into lactic acid. 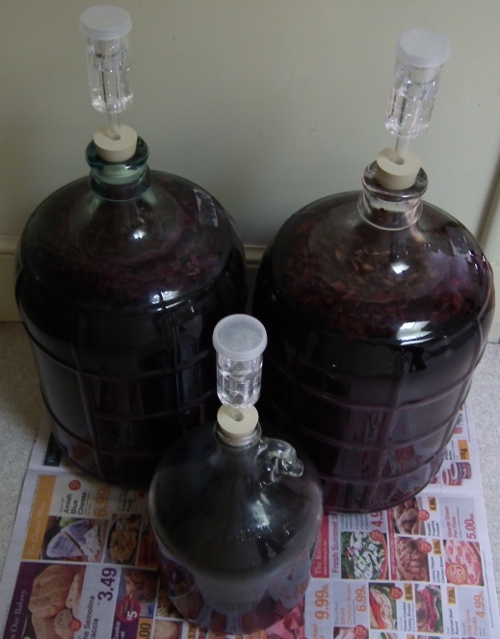 In a month we’ll rack or siphon the wine to get rid of the sediment, and then it’ll sit in the carboys till September, when we bottle and either drink or let the wine age in the bottles. 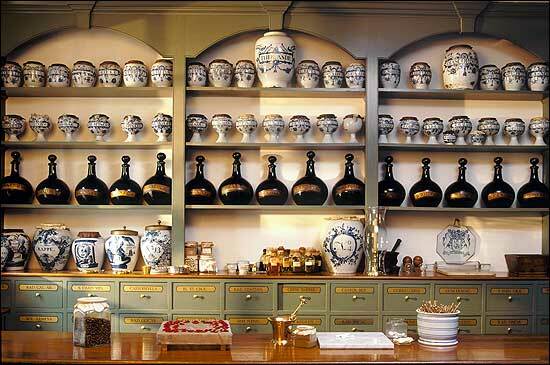 We’ll get 30 bottles of wine out of this. The must. The bucket in front has a plate covering the big hole where my honey spinner’s axle fits. The first juice pours out easily and is clear. Then there is still some juice trapped in the grapes. This you have to press through the sieve. That pressed juice has a lot of sediment so isn’t that clear. It’ll settle in the carboy and will be left after racking. The cake of skins and pips that’s left over. Compost! 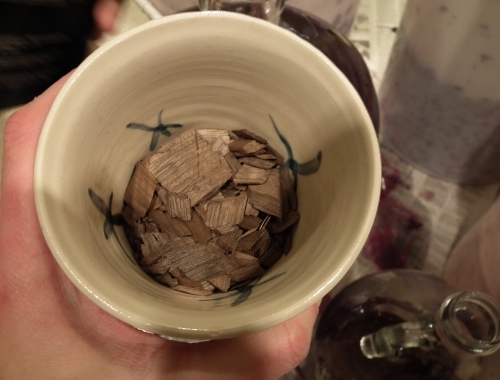 Special French oak chips, medium toast! 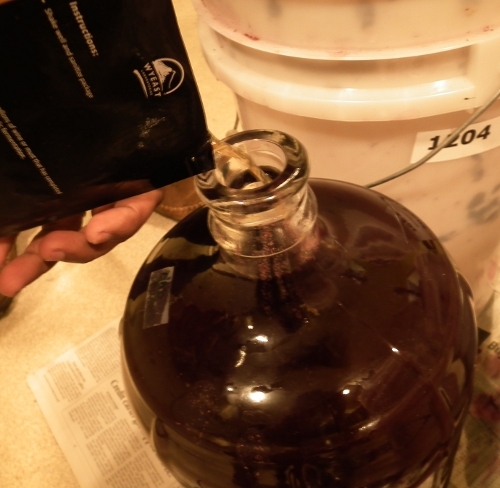 Two times three gallons and a little leftover for topping off the carboys after racking. Airlocks to keep oxygen out.